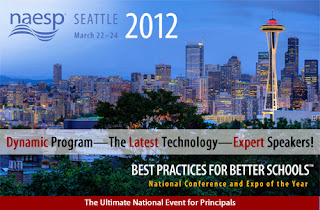 I am very excited that I get to attend this year's NAESP conference in Seattle. No- I am not a principal but I get to pretend I am one for three days! I recognize that not everyone sees the value in these types of conferences. I get that one argument against this type of thing is that my time might be better spent in the classroom with the kiddos. I agree with that- to a point. One of the reasons why I am so excited to go to this (even if I'm not a principal) is that I LOVE to learn. At a national conference you get to learn from the BEST. There are so many options for break out sessions that cover a variety of topics. I will be attending some on RTI, a few on differentiation, a couple on teacher mentors and one on professional learning communities. Learning new strategies, new techniques and methods helps me to be a better teacher when I am in the classroom. Isn't it always a good thing to work smarter not harder? Anyway, I will attempt to blog while I am away but no promises! I am going with a large group from my school, including some of my favorite new teachers- and we are spending three nights in a hotel! I can't imagine what kind of crazy shenanigans we might get up to- hopefully not as crazy as the last overnight conference I went to- but I'll save that for another post! That sounds like a lot of fun and a great opportunity too. We don't have money for that kind of professional development anymore. If I want to educate myself, it comes out of my pocket. Learn a thing or two for me!